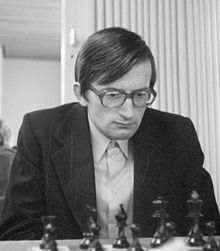 Albin Planinc or Albin Planinec (18 April 1944 – 20 December 2008) was a chess Grandmaster from Slovenia. He won the Slovenian Chess Championship in 1968 and 1971. Planinc enjoyed playing old, rarely used openings, and had an tactical style of play that led to some brilliant wins, but also some bad losses. His playing career ended by age 35 because he struggled with a mental illness, but he went on to become a trainer. ↑ * Burgess, Graham, John Nunn, and John Emms. The Mammoth Book of The World's Greatest Chess Games. 2004. ISBN 0-7867-1411-5. p. 380.